Golfers at Mannings Heath have put in an above-par display to raise a staggering £9,000 for charity. Past club captains Roger Bridge and Mary Grange have presented two cheques for £4,500 each to the Alzheimer’s Society and Parkinson’s UK charities. 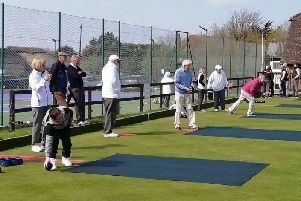 The money raised was mainly from two auctions, achieved with prizes donated by club members as well as vouchers to play at other local golf clubs, which they generously donated. Bridge said: “Mary Grange the past lady captain and I decided at the beginning of our year as captains to raise money for individual charities and then pool the money and split it equally.